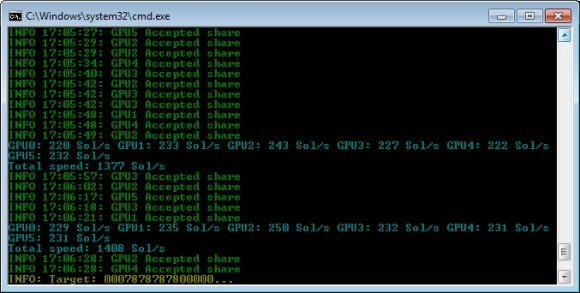 There is a new miner for Nvidia CUDA GPUs available for mining Zcash (ZEC) promising a slightly faster hashrate than the currently fastest implementation of the NiceHash EQM Zcash NVIDIA miner. The most important thing about this new miner is that it is not limited to only mining on NiceHash, so even with the same speed it is still a nice thing to have as it supports Stratum mining on other mining pools besides NiceHash (it does seem to support NiceHash’s Extranonce Subscribe as well). According to the author of the miner it is designed for Nvidia Pascal GPUs, but should work on older Compute 3.0 or higher Nvidia GPUs with at least 1 GB of video memory. Do note that the miner is not open source and there is only a Windows 64-bit binary release available at the moment, it does not seem to be based on other popular codebase and is not being reported as malicious software by antivirus products. You might still want to have something in mind as the user that posted it on Bitcointalk is a new account and not an established miner developer, even though it seems that the miner does work pretty well.